Binge eating is usually something that people do alone; they hide and indulge, only to feel disgusted with themselves moments later. Whether you feel you’re an overeater or an emotional eater – It doesn’t matter what you call it! – this information will help you understand what keeps you eating when you’re not hungry and learn how to end that. This information is extremely simple yet so often overlooked that most compulsive eaters struggle way too hard to shift their eating habits. I have helped my clients completely eliminate binge eating in as little as a single 90-minute session. There was no struggling or crying involved, just a change of perspective. So read on. It is very common to hear that the reason for your binge eating sprees is that you don’t eat the right food. This is an easy excuse. You eat too much food. Food is the culprit! I even had a scientist who firmly believes that food is the culprit write a comment on my first blog saying that she was right and she had proof. My reply to this argument is the following: “The fact that certain foods contain addictive substances doesn’t make them the root cause of food addiction.” (Tweet this) This is a classic marketing ploy trying to make you believe that “it’s not your fault – it’s because you’re the victim of something else,” such as information overload or misinformation about food. I’m not a savvy marketer so I’m going to give you my straight, honest opinion on binge-eating disorder. It’s not your fault, but it IS your responsibility. So the first step to getting out of the binge-eating loop is to stop seeing yourself as a powerless victim of external addictive substances. I don’t know you personally, but I can tell you this without a doubt: You are much more powerful than you think (Tweet this). And “with great power comes great responsibility” (–Benjamin Parker, Spider Man) (Tweet this). You have a responsibility towards yourself to find a way to get better and to stop leading the unhealthy, stressful lifestyle that comes with any form of addiction. I do agree that some foods cause withdrawal symptoms similar to drug-withdrawal symptoms, and that this may worsen an already unhealthy eating regimen. It’s certainly a good idea to avoid consuming sugar-filled foods and sodas, too many cookies, too much pizza … because they tend to cause withdrawal symptoms or mood swings. However, I do not believe these foods are the root cause of binge eating. 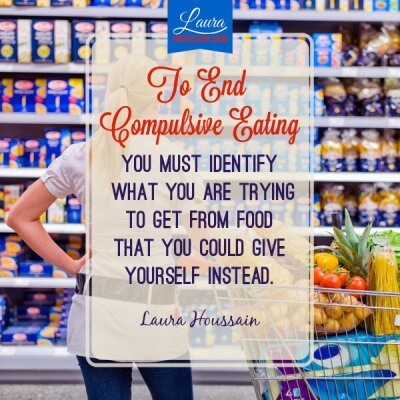 Actually, compulsive eating is not easy to conquer because you cannot stop eating entirely. You have to eat something. With alcoholism or recreational drugs, you can let go of the substance entirely. However, you can’t just let go of all foods. Learning which foods may be addictive to you and trying to let them go is a smart idea. But my question to you is this: How do you let them go in the first place if you’re already addicted to them? If the addiction comes from the food, this may seem an almost impossible task. But if the addiction is caused by the reaction of the body and the brain to the food, then maybe you can teach them to react differently. 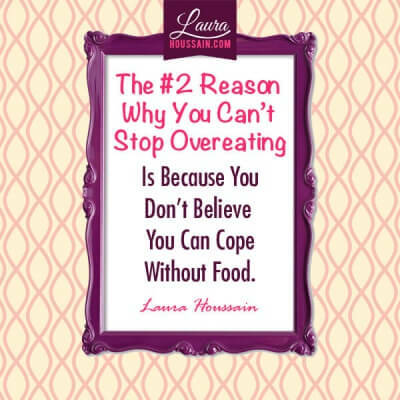 Then Why Can’t I Just Stop Binge Eating? If the root of the addiction is not just the foods, then what is it? The number one reason you can’t stop binge eating lies in the pleasure you associate with eating and the belief that you won’t be able to cope without food – or, more accurately, the temporary suppression of pain it produces. You may not feel this. 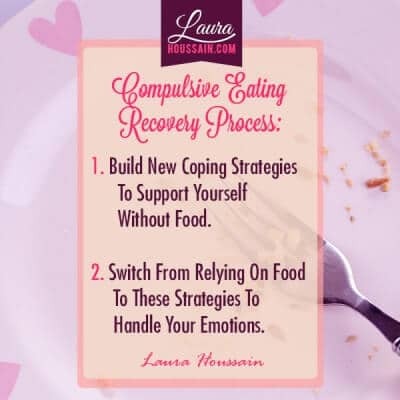 Actually, this may seem completely nonsensical because You have unconsciously learned to alleviate this pain with eating when there is too much to handle at one time because food generates a temporary release. Binge eaters sometimes hide because often one of the main underlying emotions of binge eating is shame or a feeling of unworthiness. They are usually described as “overgivers” or overly nice people. You are unique, and this may be slightly different for you, but there is a fair chance that some form of underlying shame or unworthiness may be driving your need to overeat. What most people feel is some form of anxiety and an obsession with trying to find relief. In the past, I had a tendency to derive my value from others. Instead of being obsessed with pizza or chocolate chip cookies, I would obsess about someone else. The result was the same; my focus was outside of myself. How to Avoid Binge Eating? Your obsession with food blocks you from focusing on what’s happening inside of you. Instead of giving yourself the love and care you deserve, you give your attention to food (or to whatever is the object of your addiction) and the promise of the relief it brings you. In my case, my pattern was mostly to give someone a god-like status so that their love would make me feel worthy. I would take whatever crumbs of praise my partner would give and feed on it like a starving animal. Of course, allowing another person to exert this kind of power over you can be very destructive. I have learned new ways to find self-value so that I no longer have to rely on others’ approval. To end compulsive eating permanently, you must identify what you are trying to get from food that you could give yourself instead . Which feelings are you trying so hard to suppress that you’d rather destroy your self-esteem than face it? Most of my clients have become so good at avoiding pain that they don’t even know they’re feeling it. They just know “it’s binging time!” It takes a little patience and persistence to notice the compulsive process but it’s really worth the attention. I have written a really great article that will give me more information on the process. You can read it at how to stop emotional eating. Read it thoroughly, apply its principles daily and you will change quickly. 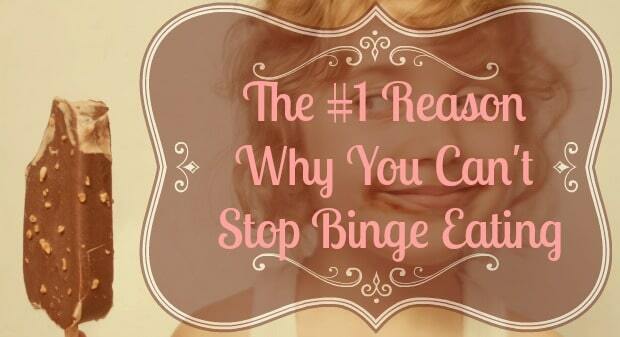 Do You Need Help to Stop Binge Eating ? If you‘re new to this blog, please subscribe to my newsletter below. Just enter your first name and email address and click on “Get it now.” I give you loads of awesome free info you can start using today to gently eliminate compulsive eating. I show my clients how to release stress and abort a binge-eating spree in minutes. I train them to bypass this automatic response of emotional pain = stress = “I must relieve stress with binge eating.” They are then in a much better position to be present to what’s happening to them emotionally and take good care of themselves without food. I would love to help you put binge eating behind you. If you’re interested, contact me at https://laurahoussain.com/contact/ to see how I can help you become a normal and naturally thin eater. You are worthy of love and care, and you are the best person to give yourself the kind of care you need – the kind of care that heals your soul. Problems arise when you lose touch with your emotions, and are controlled by thinking patterns that keep causing you stress, anxiety and the belief that only eating can bring you relief or joy. Let me show you how you can create a new relationship with yourself and food so that you can control your weight without dieting and feel relaxed, empowered and ready pursue your big dreams. Here is why again. Pushing yourself aside and not treating your true self with the loving care and respect you deserve is the number one reason why you can’t stop eating so much food. It causes an unbearable internal tension that you have learned to temporarily release with certain foods. The biggest reason that experts are not telling you this is because true healing cannot be sold as a hunger suppressant, another miracle diet, an expensive operation, or any other expensive drug. Don’t fall for the common traps! Take the first step and learn how you can support yourself in your transformation to the new, healthy, happy eater you so much want to become. Learn how to release the stress and really listen to yourself instead of taking another bite. You’ll be amazed with the results. I am so afraid by my binging, I feel I have no control and I just eat until I am feeling so unwell, I wamt to lose weight and regain my confidence so bad by I have no control over my mind. I talk myself into binging! I cant pinpoint why I want to eat everything, I have thought lomg amd gard about it vut I just dont know! I am avoiding social situations/job promotions, I am starving myself after a binge as a form of guilt amd punishment! I feel so helpless and just cant ever see a life without this. You say that you can’t ever see a life without this and I totally understand it may be hard to imagine. But you want to do this regularly. Imagine that you can change… without focusing on the how. If you want to no more about why you can’t stop eating. Then you want to read this. I feel your pain and I understand you may feel like a lost cause. But you’re not. There is an end to this. Maybe you want to give up the punishing if you notice as well it doesn’t help you stop yourself. I haven’t met anyone for whom self-punishment worked sustainably. As far as I know, it fuels and feeds compulsion like wood to a fire. I know it may look like your only alternative today. But it’s not the case. It’s a nice community of people who can relate to what you are experiencing. And let me know if you are open to stop telling yourself you can’t change and punishing yourself after reading the other post I have just shared with you. I binge when I get home from work… it’s the same thing everyday.. I eat healthy and small all day but when I get off work i start thinking about food and I already know I’m going to binge.. I get home and eat massive amounts of sugary cereals and snacks and then I eat dinner after all that.. I’m so desperate to stop.. I have a husband and 2 young kids and lots going on so I feel like it might be stress.. also I’m on zoloft which I love and has really helped with my panic and anxiety but I feel like it might have increased my appetite but I also believe that is an excuse. Thank you for sharing your comment. I can relate to eating sugary foods after coming home. Stress was a huge factor for me when I did that. But not the only factor. 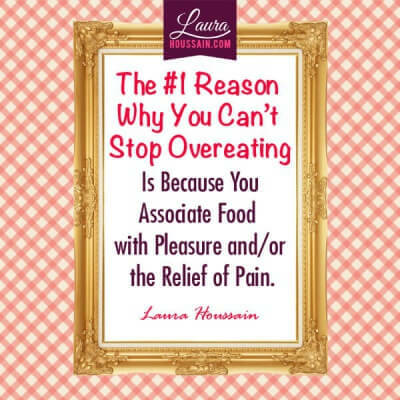 I strongly suggest you read this post https://laurahoussain.com/reason-why-you-can-t-stop-eating/ which will reveal to you even more what motivates you to eat this way. If you figure this out, everything changes. You no longer focus your energy on trying to fix the eating issue but rather what’s causing it and it makes the whole process easier. Also, if you think that you are using anxiety as an excuse, I invite you to take a good hard look at this with brutal honesty. I used to believe that fear was a good reason not to take action. I can’t believe how many years I have wasted believing that my emotions were a good reason to do or not do something. It turns out, emotions are often just signals telling us that we are stepping out of our comfort zone. That being said, as a highly sensitive person, I also needed to learn how to handle my emotions so that they wouldn’t overwhelm me completely. And, fortunately, this is completely doable with a little practice. If you want more free support, join my free community so that everyone can benefit from our conversation. I haven’t been able to stop binging for more than a month or so since I was 9 or 10 years old. I used to weigh 243 lbs at 5’10. Now I’m 185. I was at 164 two years ago for about two weeks until I got into a car wreck. Then I got depressed and put on weight again. I’d still be 164 or lighter if I just got my eating habits under control but it’s been such a regular part of my life that I do it without thinking about it. I wasn’t raised healthy and I’ve always felt lonely. I don’t want to struggle with this and be overweight and alone forever. I should get down to about 155ish for me to lose all of my fat. I don’t know why my urges overshadow my motivation 9 times out of 10. Please help me. Do I need to finish reading Brain Over Binge or something? Thank you for sharing what you have been going through. I can feel your frustration in your message. I’ll try to reply the best I can so that you can start seeing a light at the end of the tunnel today. You can try the distract to stop yourself route. But, I find that there is a reason why your urges overshadow you motivation 9 times out 10. I’ve been there. And distraction didn’t cut it for me. At least, not in a sustainable way. To me, starting asking myself why I was more motivated to act compulsively than actually stopping myself opened the door to freedom for me. because when I got the answer to this, all of the sudden I started looking at this whole problem from a different perspective. This was the first step of a larger path, but it got me better results than anything I had tried. If you want more insight, I’d be happy to help. Thank you this is literally so helpful! I was just in the middle of eating a ton, but I think I can stop now. I’ve been getting so out of control and eating so much every night lately. Yes. Kaitlin. So happy to read that. Yay! That’s a win. You’re most welcome Patti. I’m happy you’ve found this helpful. If you haven’t, you can join my free private community for extra support. I like the taste of food. I don’t eat chocolate bars on healthy days. I don’t eat Doritos. I have found that I don’t binge as often if I fix foods with different flavors- Mexican, Italian, etc. I I truly don’t think I am eating bc I’m yearning for anything (besides flavor)! Everybody has different triggers. Some say they love food. That’s because they mentally associate pleasure with eating those foods. That’s usually the common denominator of anybody who can’t stop eating. Thank you for the tip. I’m happy to hear that varying flavors helps you. I’m not surprised as it enhances your eating satisfaction. If you don’t feel another reason, it may be that you just love that rush of pleasure while eating or you’re just too busy to eat when you’re hungry and then you eat too much. I have seen numerous scenarios. I’m not saying there is only one scenario but it is not possible to cover all of them in a post. If adding flavor works for you, why don’t you try becoming a flavor expert to maximize your eating satisfaction? I always say: if you have dessert, go exquisite, go posh, go fresh, go exceptionally delicious… because it impacts your satisfaction levels and when you maximize satisfaction, you don’t need to maximize quantity. But that’s more advanced and only for people who have already somewhat mastered food addiction because when a craving hits you like a tsunami, you don’t have much choice. Why do I order food for 2 when it’s only me. My thought process is that I will have leftovers for a few days but it never happens like that. I will eat 75% of the food, and I will close my blinds when I eat. I know This is not normal and I am worried. I binge eat 2x a week for the he last few months. Please help. Thank you for your time reading my post. P.s. I drive all day caring for my hospice patients, come home and chart, no other social interaction besides daily errands. Thank you, Susan, for this comment. Being honest with yourself is a first and very important step because as you have noticed food addiction makes you lie to yourself. It makes you rationalize purchasing food you know you don’t need. If you don’t have any social interaction other than with your hospice patients, then you probably aching for a social life. And, there is a chance that food may be a substitute for company. If this resonates with you, I think you will find this post most enlightening. How to Stop Overeating Without Willpower.